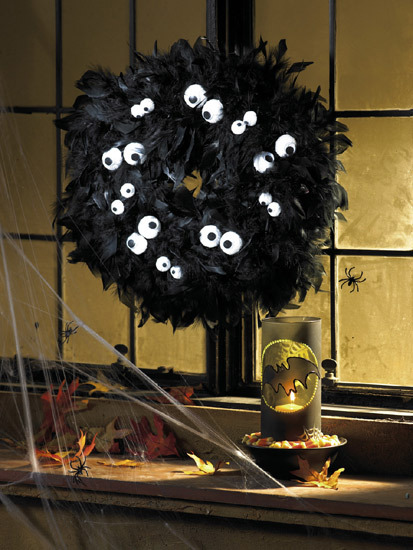 This eyeball Halloween wreath is just the right mix of spooky and fun for your Halloween party or to greet trick-or-treaters. You will need a black boa and wiggle eyes for this homemade Halloween wreath. Kids can help make too. Glue boa. Spread a generous layer of white glue over front surface of craft foam wreath. 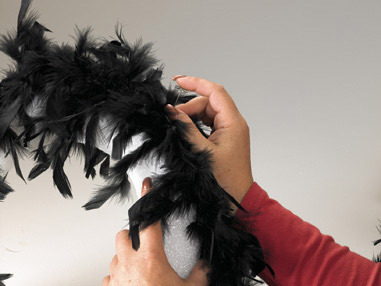 Pin one end of black feather boa to outside edge of wreath. Wind boa around and around to cover entire wreath, inserting pins to hold in place. When wreath is entirely covered, cut off excess boa. 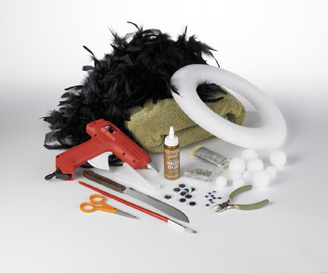 Lay a bath towel over the wreath to gently press the feathers against glue while it dries. Make eyeballs. 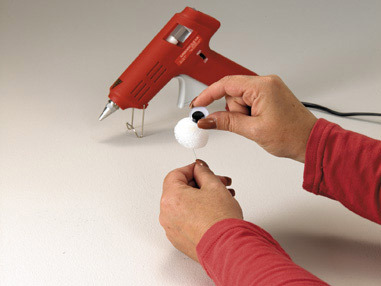 Use a serrated kitchen knife to cut all craft foam balls in half. Cut wire into twenty 2" pieces, one for each eyeball. Hot glue a wire into flat side of each ball. Hot glue one wiggle eye onto center of curved side of each ball. Attach eyeballs. Push wires of eyeballs into wreath, arranging them in pairs and spacing them evenly around the wreath. Push some eyeballs down deep into the feather and other not so deep. Finish. For a hanger, form a loop with wire, twisting ends together. Glue hanger to back of wreath. I think this is totally crazy and great. I just have to make this. My grand kids will love this for sure. I think I will add some spiders and small bats and that Will be perfect. I think I will add a big orange now at the top too. Thanks for sharing. Did you make this yet? I love your idea of adding the spiders and bats too. I have not started making one yet because I just seen this. I wish I could find glow in the dark bats and spiders that would be even scarier.And if I could find the big eyeballs instead of eyes would be creepier. But I do like these eyes too. Ihope your grands like it. I am going to do this with mine. I think that this is a great idea. I really like the eyes.